Our aim has always been to prove to the customer how genuine our product is,and match it with the original Mill Test Certificates and even provide them e-mail contact of mill representatives who assist them with the authenticity of the product. We are socially responsible to our manufacturers in a way that we try to eradicate all sorts of wrong doing and do not indulge in any kind of malpractises. Our quality control team checks each in-out product so we do not fall short of our clients expectations in anyway.Pipes,fittings and flanges are manufactured in lines of API as well as ASTM standards. 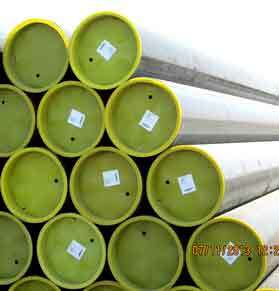 We,as an extra initiative provide stencilling as per projects on pipes for major listed oil partners of ours. As part of the centralized approach by our Managing Director Mr. Santani,stocking facilities need to be in complete control and hence they have been maintained in Jebel Ali free zone as the port proves to be more than helpful to ship all over the world.